The Project Manifesto has won a Gold Medal in the 2015 Axiom Business Book Awards! It can be purchased in hardcover and Kindle through amazon.com. Download a free excerpt here! It is also available in Portuguese. Values matter. The Project Manifesto is an entertaining, insightful novel that presents four simple values that can transform your business and your life. It’s about managing projects, but it isn’t just for project management professionals. If you have ever wanted to get more done—at home or at work, on your own or with others—you can benefit from this book. CEO and founder of ProChain Solutions, is one of the world’s leading experts on project scheduling and management using the “critical chain” approach. President and COO of ProChain Solutions, has spent nearly twenty-five years creating breakthrough process improvements. Bill is a serial entrepreneur with a diverse portfolio of startups. 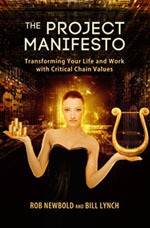 The Project Manifesto describes in an entertaining way practical changes that can lead to better business results using Critical Chain principles and methodologies. We are excited to be using the ideas described in this book to improve our ability to focus our resources and finish our projects. A fictional story that brilliantly leads to concrete steps that produce results. The Project Manifesto is a work of art! This book takes the form of a novel and it is right up there with Goldratt’s The Goal and DeMarco’s The Deadline for deep insights on real project life delivered through fiction. Rob Newbold and Bill Lynch provide the missing link to Managing Organizations the TOC Way. Rob’s earlier books, Project Management in the Fast Lane and The Billion Dollar Solution, provide the theory and detail of managing projects using Critical Chain Project Management, but the organizational behavior part has always been missing. Many good organizations struggle to invent their own set of run rules to meet the behavioral challenge. I teach that CCPM tools, and the behaviors that CCPM instills, work in any organization. And now, Rob and Bill have concisely and entertainingly given us the Values, Standards and Run Rules to make any organization become more effective—even the home. They should have titled it The Management Manifesto. Newbold and Lynch have created an exciting, fast-paced, informative story that effortlessly teaches how to better plan, execute, and track programs and projects using processes such as Critical Chain and Agile development. To a new Program or Project Manager, this is a must-read guidebook. To the veteran, it is a must-read refresher. Brilliant! This is a REALLY good book! Sometimes truth is better revealed through fiction rather than non-fiction. There are basic human truths scattered throughout The Project Manifesto that can make us all better people—improved communicators, more productive workers, and more thoughtful in our relationships.